Spanish Fork, Utah’s glass and steel reflected the red morning light, sparkling like scattered rubies. On the other side of the aircraft, under the rising sun, stretched a stark, dark contrast of wilderness terrain. The pilot navigated over the narrow edge: the interface of wilderness and humanity. The slopes, rocky and rugged, stood too tall and steep to be colonized by people, but the asphalt and concrete constructions of humanity to the west were equally challenging to invasion by wild animals. The view from the helicopter created the illusion that the boundary of wilderness was as razor sharp and distinct as the heights of the Wasatch. If one looked closer, however, intrusions became evident; the edge dulled and blurred. On a ridgeline, ski tracks ran down the face. Figure eights wove in and out of an avalanche chute. The interlopers had managed to dance down the virgin snowfield without being swallowed by it. Where humans broke trails in, animals loped their way out. Coyotes enjoyed an advantage from the intrusion, as snowmobiles created firm paths through the depths of Utah’s “greatest snow on earth.” Paw prints on packed powder led to town, where dispersing canids could find a snack of domestic house cat. Cougars followed deer that were drawn to the rosebuds of lush suburbs. When the bears awoke, they would find their way to apple trees on the edge of town. The human-wildland interface below me wasn’t a razor-edge solid border but a porous ecotone. Our machine flew over moose--one, two, three. A mother with her calf--four, five. Number six, reduced to a mat of hair and jumble of bones, the hide chewed, processed, and defecated in adjacent scats. This was the reason for our flight: reports of wolves just outside of the suburban sprawl. We found a carcass, tracks, and evidence, but no proof strong enough to identify true wolf from feral dog or hybrid. The southwest corner of wolf-range in Wyoming was barely one hundred miles away, only a morning’s walk for a wolf. We did not yet know if it was a jaunt or sortie, or if wolves had actually reestablished themselves and bred in Utah, but the line between humans and predators was blurring. It was long past time to ask the question: Could or would we learn to live with mammalian predators as close neighbors? Between past and future were a myriad of considerations. Soon after the time of the 1962 publication of Silent Spring, the pendulum of public opinion swung back, carrying with it a crying Indian, the Endangered Species Act, and Earth Day. In barely a generation, many North Americans had developed a sense of environmentalism and a depth of ecology that lacked such a concept as “varmints” (except perhaps humans). They wanted coyotes, bears, cougars, and wolves to exist. Even more, they wanted people to stop killing them. I was studying wildlife biology as the field grew rapidly and diversified. The discipline had been utilitarian, hook-and-bullet, strictly about game management, but all of a sudden it was adding elements of pure and deep ecology. As a graduate student in the 1990s, I captured, radio-collared, and followed coyotes because I believed that studying predators would lead us on the path toward coexistence. An MS, a PhD, and dozens of students and studies later, I am still sorting out the paradox of desperately wanting to conserve and increase populations of the animals that we spent so much time and energy exterminating. “My God, they’re beautiful,” Lynne Gilbert-Norton gasped, seeing a coyote for the first time. The coyote was a few yards away, on the other side of a fence, standing broadside to us. Its black-furred back faded to tan, then brushed into the red that lined the outer edges of its pointed ears, which flittered up like furry pyramids focusing sound. The yellow fires of its eyes did not look away from Lynne in deference, but peered back, insubordinately, into hers. Black lines, like Cleopatra’s eyeliner, ran from their corners. Superfluously painted and defiant, the coyote’s eyes had the duality of menace and allure. The issue, of course, was much more complicated than my innocent inquiry suggested. I was asking Lynne to find out how to live with animals that have no qualms about eating our livestock, our property, even us. How do we outsmart them on their own playing field? I knew it was going to take more than one or two biologists or a few grandfathers of conservation biology to find the answers. It would also require an army of young diverse minds, everyone from foreigners to farm boys. More than a hundred coyotes responded to my question. Waves of rapid ululations and high-pitched barks and yips filled the air. Lynne froze, uncertain. It sounded like the home team had scored in a nearby football stadium. Above us stood nature’s castellation, the raw edges of the Bear River Range. The United States had towering castles and cathedrals as did England, but ours were geological. Everywhere the new world collided with the ancient. The road leading to our location weaved between fields, one flooded with water and whitefaced ibis, others yielding young stalks of corn. An inconspicuous blue and white sign marked state property, “Utah State University Millville Wildlife Research Center,” alongside a humble plaque reading, “United States Department of Agriculture, Wildlife Services, Predator Research Facility,” indicating the collaborative federal pens and buildings sharing the land. The Predator Research Facility was crammed between rugged desert and high country mountaintops, between the fantasy of apple pie America and the reality of the abattoirs of the nearby town of Hyrum, Utah. It was wedged between university professors’ tentative search for truth and Utah’s religious roots in dominating nature and demanding that the desert bloom. For Lynne and her fellow students, it was also the base camp for a journey. She had no idea of the significance of the research that she’d signed up for, or how a simple little predator would change her life. The legends, much like the animal, changed with the arrival of newcomers. The Spanish adopted the Aztec word, coyotl, which morphed over time, the final “l” becoming an “e.” Subtle changes of meaning crept in. In Steinbeck’s The Pearl, Kino and Juana’s only son is named Coyotito, little coyote, and in the Spanish of the time the term referred to the last child produced by a family, magnifying the tragedy of his demise.7 The coyote of today’s Mexican vernacular is a shady character who smuggles people across the desert. The coyote operates in both shadow and light: it is never entirely clear whether he is beneficent or malevolent. Domestic sheep, especially lambs, are not much of a challenge for a coyote, which bears an uncanny resemblance to the closely related golden jackal, which would have eaten the domestic sheep’s ancestors on the Arabian Peninsula. The ongoing battle between humans and predators started even before our religious divisions did. Over the ages, fear and loathing of all predators has become as natural to us as growing food has. Ironically, the urban population centers of the coasts have tended to be blissfully unaware of the deep-seated resentment and conflict on the rural prairies. 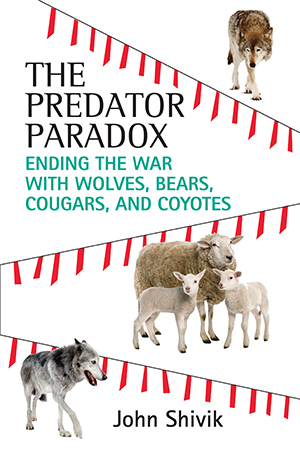 Until recently, only livestock producers felt the majority of the economic and emotional impact of the pesky predator. Although coyotes may now have a certain symbolism and mysticism for newcomers to the West, management in rural areas has been a long, intensive, and passionate tradition, inherited through generations, like a hundred-years’ war. And a war it has been. As sheep production in the United States was peaking in the 1940s, demobilization caused a surplus of military-trained pilots with the skill, fortitude, and willingness to fly at low levels. It is expected that the technological advances of war would be incorporated into other elements of life. Armed with shotguns and hanging out the back of a Piper Cub, hunters could experience the thrill of the chase while minimizing the danger of low-level flying. At least no one was shooting back. The use of aerial hunting grew after President Nixon, possibly the most environmental of all US presidents, banned the use of toxicants on public ranges in 1972.13 Before Nixon, wide-scale use of baits and carcasses laced with Compound 1080 or strychnine made it possible to kill far more coyotes (as well as any other scavenging species) across large swaths of landscape. During the 1950s, although coyotes were ranging east and north, the animals were extirpated from the Edwards Plateau of Texas, and the use of widely distributed indiscriminate poisons made it possible to keep them out. When the ban was instituted, Animal Damage Control (as Wildlife Services was known then) state directors panicked, but in short order they found other technologies, such as airplanes, that kept the body counts high. After the Civil War, the US government had new tools of destruction and newfound strength in its federal bureaucracy. Great federal juggernauts often have humble beginnings, and our current system of predator control was not created in a day.15 In 1886, the USDA created the Branch of Economic Ornithology and Mammalogy when scientists concluded something more than scarecrows was needed to reduce bird damage. In a foreshadowing of the technique of reinvention that the agency would use to grow-- or survive--the name was changed four years later to the Division of Ornithology and Mammalogy. This became the Division of Biological Survey in 1896, then the Bureau of Biological Survey in 1905. Its mission crept accordingly, with rodent control added to the list of responsibilities in 1913. With a humble budget of $125,000 in 1915, predator control began. This agency of singular purpose, but fickleness of name, became the Division of Predatory Animal and Rodent Control (PARC) in 1924. Long before current euphemisms were created, the Eradication Methods Laboratory was established in Albuquerque, New Mexico, in 1920. However, the year that heralds the transition from mission creep to federal takeover of state management of predators was 1931, with passage of the Animal Damage Control Act. Could the act’s framers have known how the federal stake in predator management would grow? Typically, in accordance with the Tenth Amendment of the US Constitution, powers not dictated to the federal government are reserved by individual states. Thus, most wildlife such as deer, elk, rabbits, beavers, and all manner of furbearers and other species are managed exclusively by each state, while interstate and international peregrinations of birds came under federal control through the Migratory Bird Treaty Act, justified under the Constitution’s commerce clause. Likewise with the Endangered Species Act. The oldest, richest, and most powerful of federal agencies intruding into states’ sovereignty over wildlife, however, remains the one created in 1931 solely to kill animals. It is now known as Wildlife Services. Name changes, bureaucratic jockeying, and growth continued through the years, but as a spiritus mundi of environmental concern developed, so did controversy over systematic, governmentsponsored destruction of wildlife. A panel formed in 1963 examined rodent and predator control activities. Its findings make up the Leopold Report, coauthored by A. Starker Leopold, son of the famous father of wildlife management, Aldo Leopold.16 The panel strongly criticized the predator control activities of what had come to be known as the Section of Predator and Rodent Control. The agency ducked, dodged, and renamed itself Wildlife Services (for the first time) but pursued little fundamental change in its activities. The next notable investigation into the agency culminated in the Cain Report in 1972.17 It made a number of recommendations, including this: “All existing toxic chemicals should be removed from registration and use for Federal operational predator control,” and this: “Federal and state legislation should make the shooting from aircraft of wildlife, including predators and game animals, illegal except under exceptional circumstances.” In response, the agency changed its name again, in 1974 acquiring the black-hat appellation representing all that is evil to modern day predator advocates: Animal Damage Control, or ADC. Everyone agreed that it was not a good fit. The agency that was sworn to kill predators was housed within the Fish and Wildlife Service, which administered the oppositely envisioned Endangered Species Act. Irreconcilable differences were acknowledged, and by 1985 ADC was transferred back to the US Department of Agriculture under the Animal and Plant Health Inspection Service (APHIS), an agency better known for veterinarians who inspect the meat supply, and for officials who enforce the Animal Welfare Act. The retransformation was complete in 1997, when the agency once again became Wildlife Services--drawing cynical criticism that it was simply trying to shrug off the bad press of previous decades by changing its letterhead instead of its activities. Predator management in the United States primarily means flying helicopters, setting cyanide ejectors, hiding traps, and using ambush and sniper tactics to slay animals. Indeed, the longest war carried out by the US government, beginning with a federal appropriation in 1914, is our war with our mammalian predators. The death toll is tremendous: 84,584 wolves, coyotes, bears, and lions were terminated by the Department of Agriculture, Wildlife Services, in 2011 alone.18 At 365, wolf deaths amounted to exactly one wolf a day for the year. Including raccoons, ungulates, birds, and all other species, a total of 3,779,024 animals were killed in 2011, according to the agency’s tabulation.19 That was a slow year; 4,997,172 animals were killed in 2008, and 4,120,295 in 2009.20 With such numbing casualty figures, modern predator management looks like a war not only with predators, but one with nature itself. The list of species and species assemblages killed (intentionally or not) by agents is several pages long and includes many innocents and questionable species, such as the American avocet, whitewinged dove, eastern bluebird, rustic bunting, northern cardinal, harlequin duck, Say’s phoebe, desert cottontail rabbit, gopher snake, tundra swan, and downy woodpecker. It is 326 entries long (see appendix). In a war, there will be collateral damage. Coyotes, for their part, are just doing what is natural for them. They seek places to make a living and raise their young. They always have more pups than will survive so that when there is a death, and a slot opens, there will be another animal there to fill it. If there is enough food and space, their numbers swell exponentially. With an average of six pups per breeding pair each year, coyotes have prodigious reproductive potential. Two have six. Two years later, each female could produce six more. Six, times six, times six. Modeling the potential growth of a coyote population is awe-inspiring. Like rats, cheat-grass, kudzu, raccoons, white-tailed deer, ragweed, and Russian thistle, coyotes generate a yearly overabundance of replacements. This list of the earth’s expanding species, the reproductive overachievers, is collectively assigned the appellation “weed species” by keen observers such as David Quammen.22 The species are called weeds, of course, because they pop up like dandelion heads in what we want to be a maintenance-free Garden of Eden. Where are humans in the list? Our long lives and reproductive ability is astounding. From 1990 to 2000, the United States population grew by 32.7 million, a whopping 13.2 percent in ten years.23 We are not that different from coyotes. How different people approach or answer those questions tells a lot about how widely fundamental human values can differ. Some people would be offended that the questions are even posed. Others are smugly confident in their own reply. Some are entrenched on one side or the other, but many struggle on the uncertain noman’s- land between. Ghostly mist hung over the lowest flats of Utah’s Cache Valley. It condensed on long-dormant stalks of flowers that had become dried packets of hopeful seeds. A white van with government license plates emerged and passed through the gates of the Predator Research Facility. The van swung left, parking in front of the terracotta and gray cinder block office building. Driven by the dean of Utah State University’s College of Natural Resources, the van was filled with congressional staff from Washington, DC. The dean had the notion that if the aides saw the potential and need for such a facility, Senator Hatch would too, and federal funds would result. The staffers pressed their faces against the van’s glass like schoolchildren, expectant breath steaming the windows as they studied the moonlike landscape, the air colder than ice, the snow as dry as dust. The low sun, straining to rise over the Bear River Range, drew long, contrasting shadows on what moments before was only white on white. The air was so clear that it hurt to look into the distance, and the sky above the mist was infinity blue. Wearing suits and ties or black business slacks or skirts, staffers piled out of the side door, pushing and bumping off each other. Their breath steamed in the cold air, but no one spoke. They formed a line, fidgeting with phones in their pockets but leaving them hidden. They focused instead on the white-capped mountains that hovered above the fog. Dean Fee Busby slammed the van door and a wail emanated from the mist to the east. At the sound, the great power-brokers stopped in place, mouths open, eyes darting. The senator’s staff, frozen like statues, had to be thawed, prodded, and herded into the building so the tour could begin. The Predator Research Facility was the brainchild of Dr. Fred Knowlton, known to many biologists from the 1970s to the v´90s as “Mr. Coyote.” Fred received his PhD in 1964, and in 1972 was assigned to what was then the Denver Wildlife Research Center’s collaborative field station at Utah State University. In 1973 he spied one hundred acres of land, only five miles from the university, where he could construct observation buildings, kennels, and labs. There was little money to build, but Fred was exceedingly frugal and clever as a coyote in bringing his dream to life. He was able to build an impressive facility with very little money. The downside of this approach: he built a large facility using very little money. He had applied the labor of biologists using miles of surplus scrap rods to create eight-foot ersatz fence posts. Stenciled lettering on tractors and the presence of a Korean War¬±vintage road grader indicated the equipment had previous lives as property of Hill Air Force Base. Nothing was thrown away. What was considered a “mound of junk” by research biologists and students was a “resource pile” to Fred. An even modest injection of funds could greatly improve the infrastructure. After introductions and an overview of the facility, Senator Hatch’s staff piled back into the van, where the station leader kneeled backward in the front passenger seat and pointed out features of the facility, as if he were giving a tour of homes of the rich and famous. All eyes were glued to the windows, no texts were read or sent. “There is nothing like it anywhere,” the station leader spouted enthusiastically. “What we have here is a full staff--the best staff that has ever been assembled in the history of the planet--all dedicated to learning about predators. We have students that come here from all over the world. We are developing methods that will help resolve conflicts between humans and predators. We are trying to help people, but if we do it right, we will help coyotes too. And not only coyotes . . . wolves, bears, cougars . . . all predators.” “Will coyotes--I mean, if you don’t do anything--go extinct” a staffer asked innocently. The others shuffled in their seats. Some nodded, some cocked their heads inquisitively. Indeed, the significance of human action on the landscape is much greater than just the point-source plopping down of a house. Humans create a plethora of food, cover, and habitat. It is difficult to think of the American West in a nascent, pristine state, without the human touch. We divert streams and rivers to lower the peaks of spring floods and to dribble water through the droughts of fall. Our garbage, bird feeders, and pet food bowls sustain the lowest rungs on the food ladder. What one species does on the landscape can alter the entire composition of the plant and animal communities there: after we build the prey base, the predators come. Bears sleep under decks in the Lake Tahoe area and coyotes stroll across parks in urban Chicago. Cougars follow deer that invaded to browse on rose hips and wolves lope through calving pastures. The packed van weaved through curves, passing near pens. Some coyotes, fluffy and comfortable in the cold, rested calmly on their shade shelters. They curled up on the meter-high tables with their tails brushed over their snouts. A few raised one eyelid and then went back to sleep. Others were already wide awake, running the length of the fence silently, not barking as a dog would, despite their Latin name, Canis latrans, meaning “barking dog.” A few stalked the vehicle intently, as if they were following blind bison across the valley. Some pranced at the edge of the"” “"fence and raised their snouts and sniffed at the air. Still others backed away to the point in their pen most distant from the access road and huddled, concealed in a long shadow, eyeing the visitors diffidently. The van swept along a two-mile loop as the station leader pointed to a broken bit of fence here, or noted the dream of a new and better captive-animal habitat there, until they arrived again at the main office parking lot. Staffers poured out and followed the station leader into the shop section of the lab building. Displayed prominently on the back wall were dozens of medieval- looking capture devices, beefy metal springs and unfathomable mechanisms with ruthless jaws. Everyone winced, imagining the horrors of the hardware as if they had stepped into Torquemada’s dungeon.